Gainesville Modern Quilters have reserved the classroom at JoAnn’s Fabrics for a Sew Day on Sunday, July 27th from 10 am to 6 pm. All members are welcome. The purpose of the Sew Day is for us to spend the day with guild members to share our love of quilting, for experienced quilters to mentor the new quilters and for the members to get to know each other better. Everyone should bring their machine and basic sewing supplies. We will be working on a pattern published by Moda Bake Shop, Lattice Bones by Julie Hirt. At our meeting Wednesday night we discussed that it would be helpful if everyone cut their fabric ahead of time, as there isn’t much room to cut fabric in JoAnn’s classroom. Moda Bake Shop patterns promote Moda Fabric Pre-Cut fabrics, therefore the instructions call for 1 jelly roll of print fabric and 1 jelly roll of background fabric. If you are going to use jelly rolls, cut your fabrics just like the pattern directs. I recommend using a jelly roll for the lattice and if you want to use yardage for the background, please see the steps below. 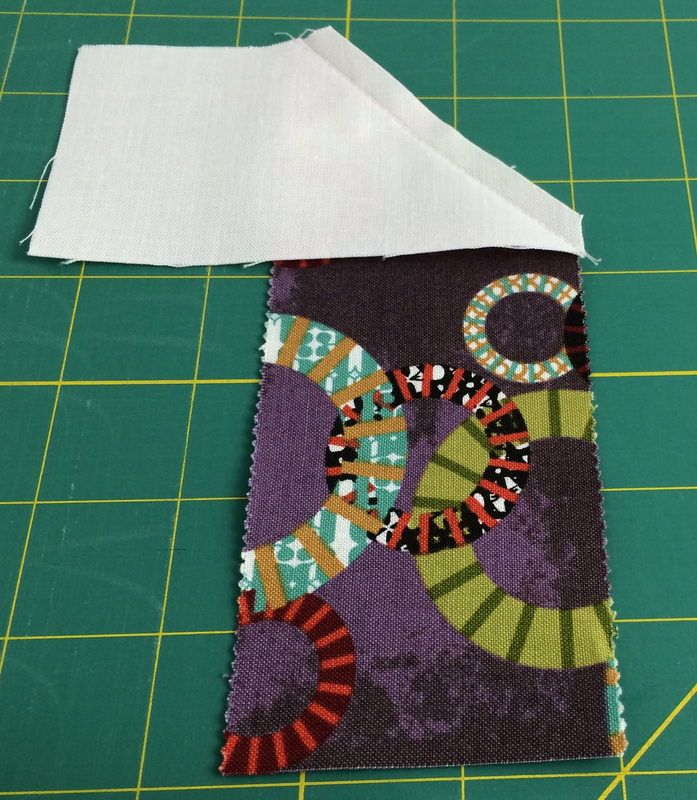 Some of our members may not be familiar with the term “jelly roll.” Jelly Rolls are usually one fabric collection that has been cut into 2 1/2″ strips and rolled up in a jelly roll fashion (usually 40 – 42 strips). The Fat Quarter Shop has a good selection of pre-cut fabrics. Since we don’t have a local quilt shop in our area, I recommend you look online for your jelly rolls if you don’t already have one that you want to use for this quilt. I am using the “Juggling Summer” fabric collection by Zen Chic for Moda Fabrics. I have saved this jelly roll for just the right project. I am also using Robert Kaufmann Kona Solid White for the background. You will need 2 yards of background fabric. 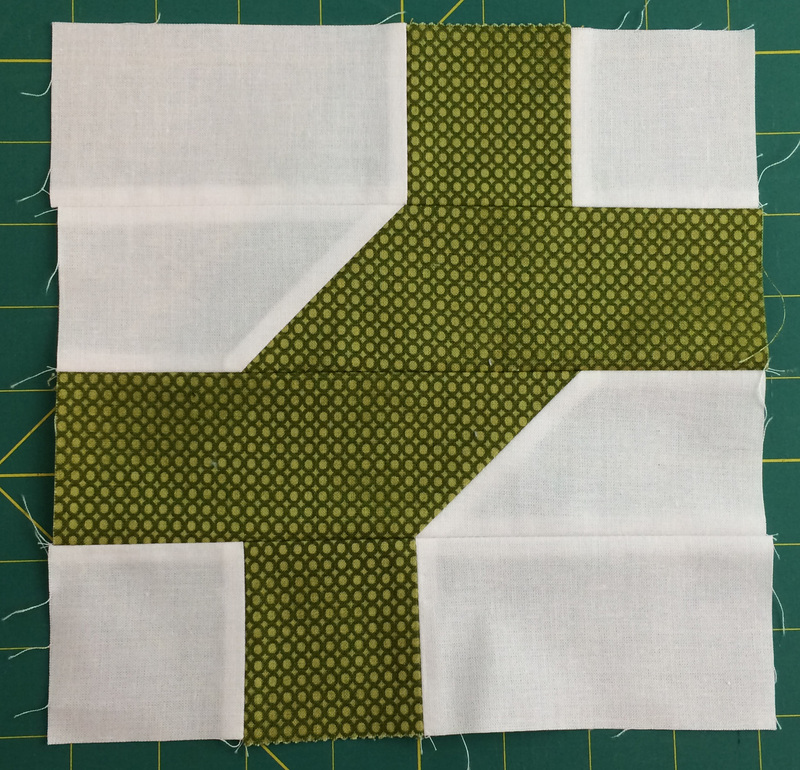 What follows are step by step photos of how I cut my fabric and constructed my test blocks. I stack my strips (5-6 strips) before I cut. Make sure you have a new blade in your rotary cutter. 3. 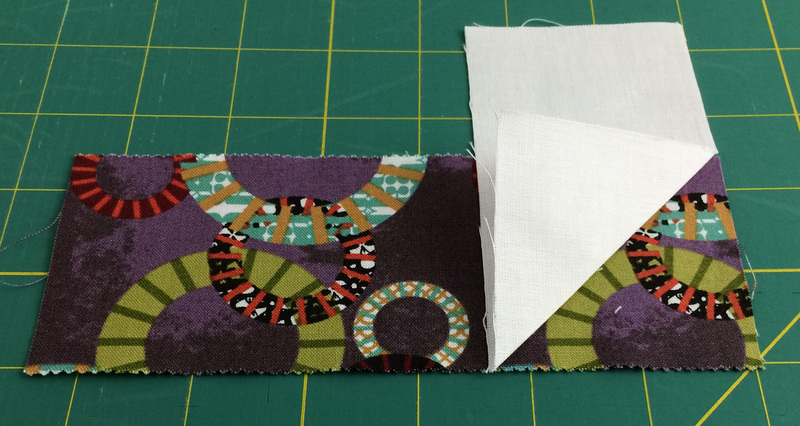 Piece Unit 1: Fold one end of the background fabric (2.5″ x 4.5″) to create a triangle. Press or finger press. 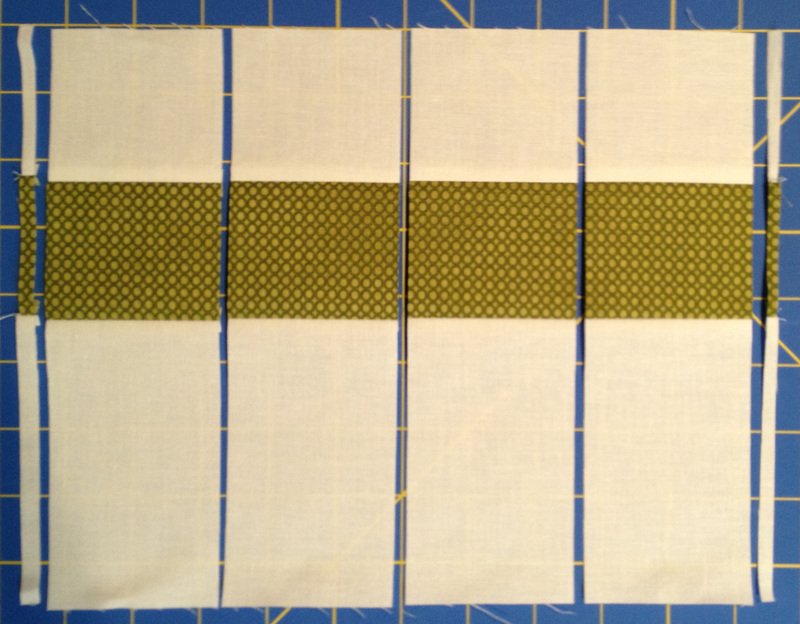 Now sew one print piece (2.5′ x 6.5″) to one background on the folded line. 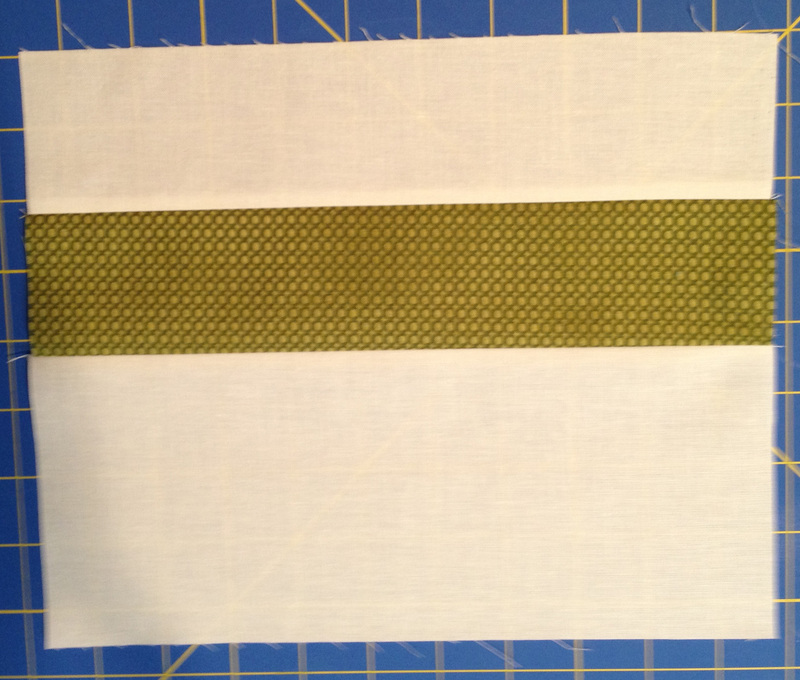 Trim the seam to 1/4.” Press (use your preferred method-I press my seams open). Make sure you place the background fabric on the print fabric the same way each time to get the correct angle. Make two Unit 1 pieces for each block. 4. Piece Unit 2: Sew the long edge of the 10.5″ x 2.5″ background fabric piece to the long edge 10.5″ x 2.5″ print fabric piece. Next, sew the long edge of the 10.5″ x 4.5″ background fabric piece to the remaining long edge of the 10.5″ x 2.5″ print fabric piece. Press seams. 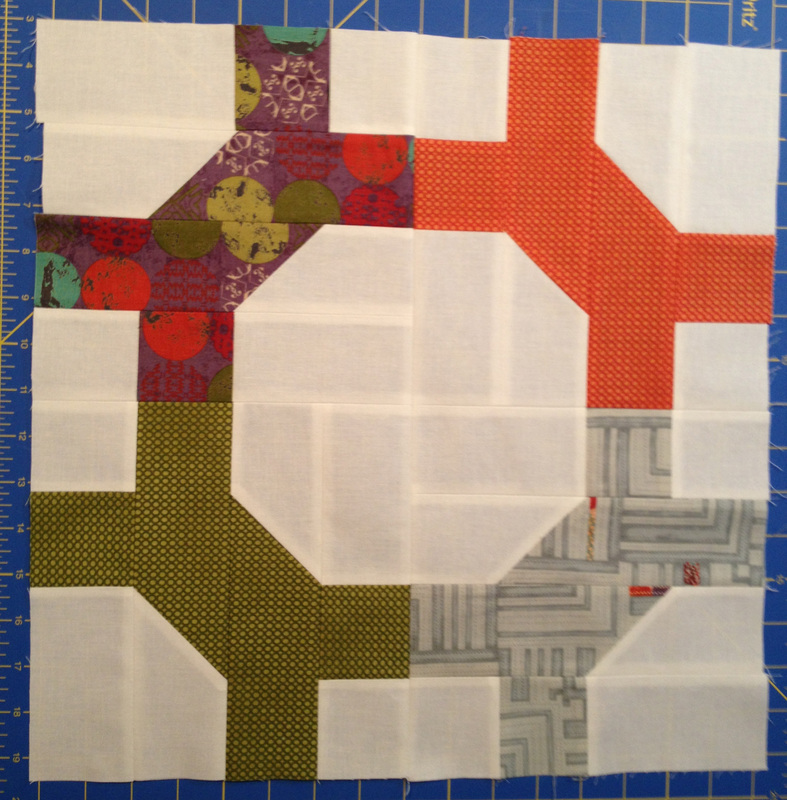 Now sub-cut (cross-cut) this pieced segment into four 2.5″ units. You will now have four Unit 2 pieces. Use two Unit 2 pieces for each block. 5. Assembly of Block: Layout two Unit 1 pieces and two Unit 2 pieces and rotate the pieces of the unit until your block looks like a “dog bone” (see photo). Sew four of these blocks to make one large block. You will be making 64 of the “bone” blocks. 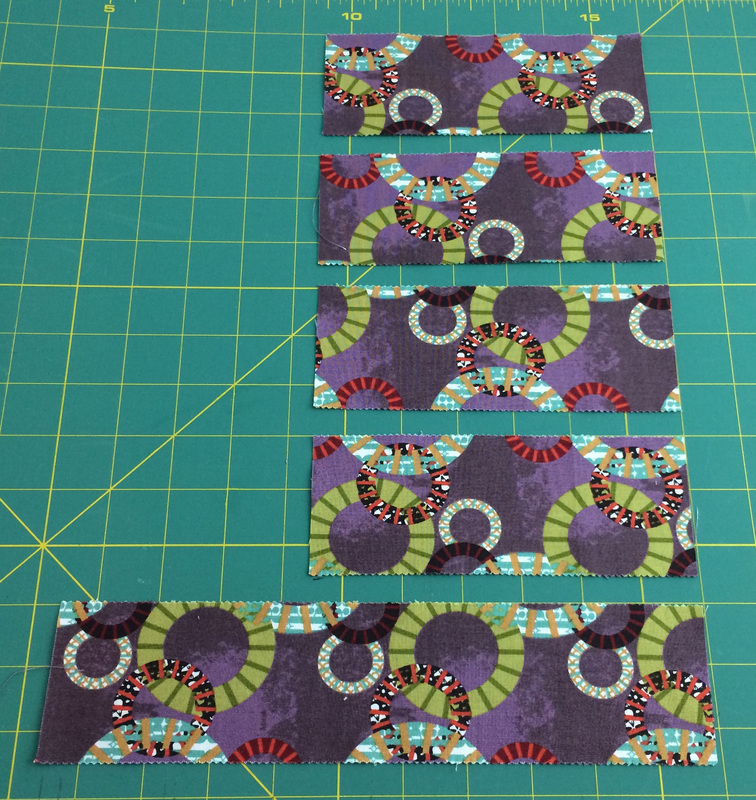 You should be able to make two blocks from one of the print jelly roll strips. I hope everyone has a great 4th of July. Happy Sewing!